Anyone had any thoughts on a laser cutter head in place of an extruder on a darwin or repstrap . How much laser power is actualy needed to cut 3.8mm/4mm ply and would salvagable laser diodes have enough umph to do the job ?? > place of an extruder on a darwin or repstrap . There has been considerable discussion about this heretofore. > have enough umph to do the job ?? I've got the impression that they don't from the forum entries that I've seen so far. I can't swear to that, though. My first runs were with a 3-Watt and two 5-Watt-CO2-lasers where i used to cut plastic-sheets, paper and leather until 3mm thickness - it did work, but the fuming is highly acidic, poisonous and heavy carcinogene!!! With a 8-Watt pigtailed diode-laser (run at 4 Watt max.) i built a micro-welding-tool for welding thin platin-wires on gold with gold-paste. I used this for experimenting with cutting plastic-foils too - the cuts were thinner than with the 5-Watt-CO2-laser, but i managed 1mm thick sheets only. The fuming is the same problem. Now i have to play with the 1-Watt pigtailed diode-laser, where i have a glass-fiber with a core of 60 microns diameter and an optical head with the focus of the same size too, but i think this toy will only cut good absorbing materials until 0,5 mm thickness only. Edited 1 time(s). Last edit at 07/03/2008 03:23PM by Viktor. Yup I had pretty much gathered most of that reading around and I agree with you guys. How much power do you realy need to cut 3.8/4mm plywood/mdf ?? What wavelength is best for cutting plywood/mdf ?? Anybody got any gear that can measure the spectra of incident and reflected light from plywood/mdf to see ?? Interestingly enough my readings suggested that UV low power laser diodes are also available and could be useful to draw out PCB's etc on standard pre-sensitised board. Before the usual developing and etching route. Just think what fraction of a full darwin would function as a photoplotter/laser cutter. I have been having the same conversation with Tobyborland wizardly wood guy. "The laser uses a CO2 tube and so runs at 10.64 microns. We use 100% power (energy) at 15% of full speed to cut the Teksoft plywood. Note that the slower the laser beam travels, the more time it has to cut through the material." Tobys considered opinion is that it is probably more hassle than it's worth to DIY when there are cost effective bureau services around and I have to agree with him. Unfortunately "i just gots ta know" the details being that sad sort of guy. I was going to put a laser on mine too, but the salvaged ones are not good for much. I was looking into a 2-5+ watt diode. I want to stay away from gas powered ones just to keep it simple (and safer). It would probably take too much power to do anything significant that wouldn't be easier with a CNC toolhead. I was going to use mine for laser etching, PCB, possibly SLS or SLA prototyping or something along those lines. Dylan, the gas lasers use a gas AFAIK sealed in a tube (sorta like a fluorescent lamp). Often they need cooling with a water circuit. 1. A clean gas is blown across the focussing lens. Because it hangs over the workpiece it can be contaminated by solid and gasious material blown from the cut. (optics are very expensive because they are not glass. Co2 laser energy is absorbed by glass (so you can laser cut glass sheet) so all mirrors are polished metal too. 2. Gasses are blown into the cut, usually from a gas nozzle thet is co-axial with the laser beam. This blows burnt/melted material away from the cut. it helps prevent fires in wood/paper/plastic. In Carbon steel cutting, oxygen is used as it helps increase the temperature and thus the cutting speed. Stainless steels use nitrogen (which is slower but gives a beauiful edge) because oxygen causes removed material to build up on the back edge of the cut as a nasty sharp and very hard jagged edge. I have used local laser cutting companies for many steel fabrication projects and I can througherly reccommend : www.acornlaser.co.uk in Washington (UK). Their lasers are about 3kw ! edit: co2 lasers use a small consumable gas flow in the lasing tube. The point is, its not gasoline or flamable gas. THe dangerous bit is the IR light in the beam and reflected off the workpiece. Edited 2 time(s). Last edit at 07/05/2008 06:43AM by Richard Benjamin. Looking through the manuals [www.epiloglaser.com] for the machinery that Toby has available to him and cross referencing this with some DIY cutters documented on the internet. I also have done a read through manufacturers data sheets and looked to see how they were constructing diode arrays and module. The following observations are worth considering. I will limit my discussion to light duty low wattage work ie cutting ply for the moment and consider metals (high wattage and nasty fumes) out side the scope of this posting. For light duty work (particularly cutting ply etc) a vaccum bed drawn on by standard vacuum cleaner should be good enough provided that an auxiliary suction tube is teed into the bed and looped around to keep the top side of the workpiece clear on non penetrating burning/etching. To make a vacuum bed make an air tight shallow plywood box with internal bracing draw a vacuum on it and proceed to burn holes in it on a regular grid using the laser cutter. It may be possible to combine the outputs of up to 4 laser diodes using a pyramid style prism (Maybe more if a ring arrangement is adapted with a fancy conical prism, Don't know really though my optics is unexplored as yet) to deflect the beams to overlap onto the first of the collimating lenses. Higher power pumping diodes (cheaply available or scavengable) may be an option. 4 * 500mw = 2 watts. But would this actually be enough ?? Infrared Frequencies may be the best for cutting rather than visible wavelengths. Safety could be an issue with this. A simple plastic shield made from IR fluorescing material could be used to offer protection from back scatter (specular reflection), guide airflow over the lens assembly and show when the laser was actually working. Ummm and that's about all I have managed to scrape together so far. Regarding safety issues, it's not just frying your eyeballs. MIT's Center for Bits and Atoms had a fire due to someone leaving a laser cutter unattended. I think I am worried about the Mononeuron guy. The amount of cash the guy is throwing at the project is a touch unreal. If you had a 5 Watt laser, it would be quite possible to do some limited SLS. The main problem you would be facing is controlling bed temperatures. The less laser power you have available to you, the more accurate your temperature's are going to have to be. The material in an SLS machine is brought up to just below melt temperature using regular IR heaters, the laser is used just to 'push' the temperature slightly past the melting point, selectively. With Nylon, the temperature variances for a successful build are less than +/- 2C at 185C. I'd love to help if someone was considering designing such a home-grown SLS solution. I have many years experience dealing with Commercial machines and could provide a lot of valuable info. If I was going to go that way (or for a few other reasons) I might enclose my machine and put a few heating coils in there to get a good ambient temp going so the work space wouldn't be that far off from the construction piece. I also wanted to stick with a diode because it's a lot cheaper, requires less power, smaller, etc. I noticed that the latest laser cut plywood panels have a full box design in place of the Darwin 8mm bars&corners etc. This would be interesting. The problem of sealing the top to keep the heat in & the motors etc in cool air could be solved by horizontal roller blinds ? one on each side leaving a narrow slot for the extruder. springs balance (sortof) and low inertia. Disable the centrifugal latch thingy in the roller. Brush stip on the edges to reduce leakage from the slot. fans for internal circulaton to even out temperatures. I haven't seen the ply plans you mentioned, Where can I find them. They sound interesting ?? Base and Bottom = ok. The base is the Z platform - guided by two vertical rods and lifted by 4 screws as Darwin. Top = error in the location of one of the tags (bottom left). Note this carries the Z motor. Short sides (in the same file as long sides) = need work at the top to locate the Y axis sliding rods. Also, the tags are still isolated and have T nut slots partially in. Long sides = need a cutout to clear the X axis motor? I assume the T nut slots are an attempt to mimic the FabAtHome arrangement to hold it all together. I would be tempted to keep it simple and use PVA glue or woodscrews. Or some nice over-centre clips to hold the bottom on so the z table can be disantled. Yes this is something I think Vic is working on. I am currently looking in-to building a ply darwin and could'nt remember seing what you described. These look to be a work in progress. I am curently fancying Tobyborlands reniditions as they look to be pretty much one for one replacments for the Darwin pastic parts. Basicaly meaning that I could built it with ply parts then print out replacement plastic parts and safeguard the investment I had already made in all th rest of the parts thet make up the end product. The Repstraps like the Mac wire etc are realy great. I just want to avoid ending up with two machines rather than one. When I am working on another again to do cnc milling anyway. Being a wood junky it looks fun and very enticing to my eye too. BTW Richard sorry for glancing at your name and getting them the wrong way around, My fault. I've been meaning to reply to your post for a bit but wanted to check with my brother who actually works with lasers first. First the bad news, combining 4 beams would be both very difficult to align and expensive for the beam combiners. If your using CO2 with a good mode and a 50 micron spot (the norm for cutting) you can punch a clean hole through a tongue depressor (approx. 2 mm thick) with a 0.1sec pulse at less than 10W. 15W should go through 4 mm. The 2 most important things for cutting and not burning are spot size and time - the shorter the pulse the less surrounding tissue will be burned, but more power is required. The smaller the spot, the less power needed. Laser diodes can be over driven. Their ratings are for the CW power ie Continuous Wave as opposed to pulsed operation. You can increase the current and increase the output but need to run them at a shorter duty cycle ie off for part of the time to allow the heat to dissipate. Water cooling the heatsink/mounting helps too. The total dissipation over time will be about the same and cannot be any greater without inducing failure. However for the duration of the pulse (PWM Drive) the current can be higher. I guess the only real question remaining on pulsed operation (Cos I Don't know about Laser Diodes really) is what sort of curve/line do you get at increased drive/reduced duty cycle ???? ie If I drove one at twice the current for half the time would I actually really get twice the output power for the duration of the pulse (ie peak power). PWM Drive of Laser Diodes should be incredibly easy. almost exactly like PWM driving an LED but with more power. OK On optics how do we measure how small a spot we are getting sensibly using Kitchen Table Technology ???? In my development of a plastic-foil-cutting laserplotter with a 5-Watt RF-CO2-laser i experimented with some materials (wood, paper, leather, plastic, ...) and managed to cut until 3mm of good absorbing materials but failed to cut 0,3mm of some others. A diode-laser is much more material-sensitive, so you have to select your sheets carefully or it wouldn work. When you drive your laser with PWM then you have to calculate the actual speed of the laser-head, or the traces woudn't be uniform. In my laser-plotter i solved this with a trick: - i simply .OR.-combined the STEP-pulses of the X- and Y-axes and aplied a counter, so the laser could burn a hole if any of the two axes made a movement or in a harmonic factor - e.g. every 8th step or so. Yes I think you have something there Viktor. Basically step, zap, step, zap etc but number of steps determined by diameter of laser zapped hole. Sounds very doable on a Darwin. Must admit I don't fancy the bulk of a tube though. Diodes are nice and compact. Low voltage too. Easy for a Darwin to robot handle. I guess low mass = low inertia too so better for stability. Less for a home constructor to do themselves damage with if there aspirations exceed their capabilities. (Bit like me really). Yup I think overall we have summed up the know how here, just need devices that fit the price bracket and required power levels some how. And a bunch of experimentation. With Diodes the drive circuitry and control won't be much different from what is already used for the extruder. If not it doesn't sound far fetched to get the energy density required for cutting wood, even if the max power doesn't quite scale linearly. The final parts of the equation is checking the optics will do what we want, or finding some that will. Focal Distance: enough space to blow the smoke away and keep the lens clean. I'm not sure what that would be though. yep tube lasers are much more bulky than diodes and so are normally mounted in a fixed position with the work piece moved below them. Which wouldn't suit the darwin bot. The other way involves mirrors but seems needlessly complex comparatively. I'm sure everyone knows about laser safety or would read up on it before turning anything bright on, but I feel I should mention that at these power levels/densities reflections can cause permanent damage to sight. No need to even look into the beam to have strange blind spots for the rest of your life. What's not drawn are three small mirrors (two fixed and one at the moving bridge), which feed the beam until the optical head - the small tube (45) atached to the tool-head (8) with a last mirror and a Germanium- or ZnSe-lens inside. Edited 1 time(s). Last edit at 07/09/2008 04:03AM by Viktor. Higher tech (probably equally not doable on a kitchen table) is to increase the wavelength by using the laser diodes to pump something crystal wise that has an output more into the IR or closer to the ideal cutting wavelength (for wood or organic material that is). The green Laser pointers appear to use an intermediate stage where an IR pumping diode pumps a crystal that has a wavelength in the 1xxx range which in turn pumps the crystal that turns out the green laser light of the pointer. Again I am getting towards the limits of my capabilities optically here until I have read a bunch more. I wonder if it would be possible to Pump a sealed CO2 tube with Laser diodes and get a suitable beam size/divergence and power level ?? Oh and as an aside I read about Q switching where the lasing medium is pumped continuously to store energy in it and then the output is switched to deliver all that is stored in a single pulse. Don't know if this could be useful too for punching holes in things. These two methods have the feeling of being expensive and difficult for the average home guy like me though. What do you guys think ???? With pumping you loose much initial power, so your pumping energy has to be much higher then the output - a typical green laserpointer uses 500mW IR-diodes for an output of 1 to 3mW. For Q-switching and resonance-improving you need an extrmely accurate optical setup with positioning accuracies in fractions of the wavelength! Just sped-read through the entire thread. I've recently been doing some research into lasers for a separate project of mine. I think perhaps the best option for a RepRap laser cutting head would be a carbon dioxide gas laser. Unlike other gas lasers, they are really compact for their power output. I think the biggest problem with using such a high powered laser (rather, any laser that can effectively be used for cutting) is that it presents a danger element to both the operator and, more overlooked, the machine. Danger to the operator is easily (well...) controlled by containing the entire apparatus (the entire Darwin) in an absorbing or internally reflecting material, specific to the laser's wavelength. It may, unfortunately, prove much more difficult to prevent damage to the equipment - both the darwin and the laser itself. The laser fires and hits the material to be cut. If the beam (or part of it) is reflected, it may present a danger to anything inside the cartbot, possibly engraving or even punching holes in the equipment. There's also the possibility of cutting into the material that is holding the subject up (the platform) after the subject is cut all the way through, and/or deflection off this (this part, the subject holder, is easier to protect, as it can be made of a substance that absorbs and dissipates the laser energy, etc). Once a concentrated enough beam is deflected, it can essentially go anywhere (in laser safety, I like to treat reflected beams with this assumption, because you can't always calculate the possible reflection angles - the surface of an object is never completely flat). A little imagination and you've got the reflected laser punching a hole in a primary support, which collapses the cartbot, tipping over the laser; laser then starts cutting into lots of stuff (like your arms and eyes). In any case, I don't mean to discourage, but a healthy amount of fear is necessary when dealing with mobile Class IV lasers you made yourself. I think perhaps the best option for a RepRap laser cutting head would be a carbon dioxide gas laser. I could be wrong, but I believe that this is the usual sort of device used in laser cutting systems. The problem is, they are expensive, delicate, and rather bulky hence the interest in assembling something using solid state laser diodes instead which will be an order of magnitude cheaper and easily mountable on the darwin cartesian robot. Treating such a device with respect is fine. Put it in a nice box, have some sensible safety interlocks, invest in some appropriate eye protection. But the chances of doing serious damage to anything, the items it is intended to cut included, seems slim. ... as example: i have a pigtailed 1W-diode-laser, where the fiber-core has a diameter of 60 microns. With a selfmade optical head assembled from two lenses with 15mm diameter and some tubes i'll have a fine lightweight laser-head in dimensions of 20mm diameter and 100mm heighth with a shielded glass-fiber of 1,5meters to the diode and cooling system. When working properly, you have a ~60micron-spot of intense IR-light with 1Watt max. on the bed or material, which would radiate diffuse and homogenous to the surrounding. So it's a matter of preparation and handling-precautions, what's a serious piece of work and riscs, when gave way to an open community! Edited 1 time(s). Last edit at 07/23/2008 08:02AM by Viktor. This post is fairly long (it's a nasty habit of mine, sorry). Most of the important information (imo) is in the last multi-sentence paragraph, so jump down there if you're short on time. > cutting head would be a carbon dioxide gas laser. Quite so. For laser cutting and drilling, Nd:YAG and CO2 lasers are generally the most common. "Gas lasers are very rugged - the material that actually makes the beam is a gas and therefore cannot be damaged. Solid-state lasers use a crystal to generate the beam. These crystal rods are very expensive - several thousand dollars for an industrial size laser. If the laser is improperly tuned or operated the crystal can be almost instantly destroyed." Granted, the gas tube itself is vulnerable in a CO2 laser, but these are generally more rugged than the crystals in solid-state lasers. That's all the good news . The bulkiness comment is true. However, you could probably mount it somewhere close to the cartbot and mount a controlled optical (mirrors) system where the extruder head would normally go. I think this is basically about what you're going to have to do for any cutting laser, as even smaller solid-state lasers would be long and take too much space (though some are small enough to be mounted directly, they would be much less powerful and much slower). The difference would be that the CO2 optical system would need to be made of mirrors due to its long wavelength (which means it can't be guided by optical fibers), whereas a solid state laser like a Nd:YAG could use optical fibers (a tube which could be easily rigged to the toolhead mount). In any case, the mounting is not a major problem (personally I think the mounting system could be kind fun). It is true that they are expensive. However, any laser with enough power to cut effectively will be expensive (until we can get a RepRap toolhead that can make glass tubes; that'd be cool). You're paying for the power. The truth is, for cutting, you'd probably spend less on a CO2 laser than a Nd:YAG of the same cutting speed. If you look at the various CO2 vs Nd:YAG comparisons here [www.repairfaq.org], you'll see why. Basically, Nd:YAG's have less power and focus, and are generally better for pulsed operation (though they can be effectively used in continuous operation). This makes them great for drilling holes and stuff (if you want to make PCBs, this could help). In any case, to quantify: you'll be spending around $400-$5000 (or more) on any cutting laser for this purpose (as far as I can tell at this point). I think you can get a CO2 laser for under $1000 that can do an okay job of cutting (I'm betting it will be slow, but that's okay). The same website also has advice on how to go about building or acquiring such a laser. > failure mode you mention. I got carried away. It just seemed like a cool train of thought at the time. This simply isn't true. A laser powerful enough to cut through steel (which is what Nd:YAG and CO2 lasers are commonly used for) when focused will burn things even when unfocused. This also applies to lower power lasers. According to Sam, someone (I don't recall if it was Sam or one of his associates, it's posted somewhere on his site) was able to burn a mark on a target with an unfocused SSY1 (a Nd:YAG laser with a power output estimated between 10 and 50 mJ, fairly small compared to what we would be using). But yes, the Deflected RepRap Death Star Laser (DRRDSL) is unlikely. > to be very small indeed. The fact that it's more focused just makes it more powerful. Possibly. But then again it's possible that a cutting laser at all is out of our league . In any case, it's not unreasonable to imagine that during a long (2-10 hour) cutting session, the laser focuses on the wrong object (the cartbot) for a few seconds or minutes or hours and cuts itself up, making for an unstable platform which leads to further damage. If it breaks one of its supports and makes an opening to the outside environment, which includes the organic objects I like to call "hoomins", the laser then has access to those organic objects I like to call "hoomins". The organic objects I like to call "hoomins" also contain organic objects I like to call "eyes". (Sorry, I got carried away again. But seriously, it's a realistic possibility, just as it is a realistic possibility that you cut a finger off with a circular saw). Oh, and the fact that the RepRap's parts are increasingly becoming RepRappable means that more parts will be plastic, which means more parts can be more easily cut. > cut included, seems slim. True, all except the "items it is intended to cut included" part. The chance of screwing up the target object are high, especially in the first year or so of development (based on what I've seen from the RepRap project so far). Don't underestimate the power of human error. The humans design the system, and error gets transferred. It is an inevitability. We just have to make sure that we decrease the amount of risk to an acceptable level. We do that by taking those precautions you stated (you put that rather well, by the way). In any case, the biggest barrier to a laser cutting head will be cost. Having to mount an $800 head on a $300 machine is just discouraging. Perhaps we can look into glass rapid prototyping and other materials, etc. It does seem to be an interesting coincidence that thermoplastics "freeze to a brittle, very glassy state when cooled sufficiently" [en.wikipedia.org]. I wonder if it's possible to use some thermoplastic instead of glass as the tube material, and if we could possibly RepRap the tube. Correct me if I'm wrong, but the tube does seem to be a major factor in cost (as well as pumping the tube with the actual carbon dioxide/carbon monoxide/nitrogen/helium mixture). It would be really cool if we could RepRap away even 50% of the cost of a high powered cutting/drilling laser. ... the tubes are from (quartz-)glass because of the rigidity and thermic stability as they carry the beam-filters and resonators which have to stay in a defined position with sub-wavelength accuracies - plastic wouldn't give this sorts of stiffness! My idea isn't to cut thick sheets of steel or so, but only 0,1mm thick sheets of black plastic, i stack together with glueing/welding, then cutting the contours in the topmost sheet, and so on. 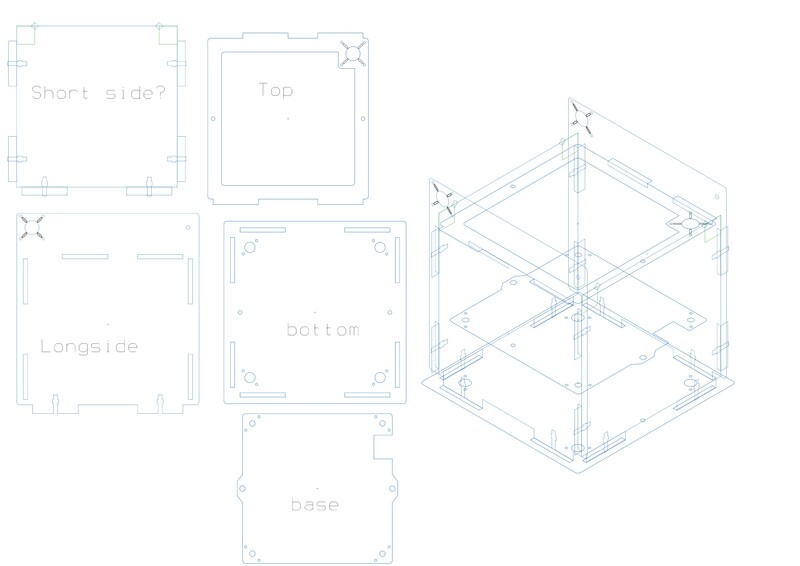 This is the LOM-approach of fabbing 3D-objects out of thin sheets of prefabbed material, so you have only to process the contourlines of every sheet and some extra cutting lines for separating the outsides from the embedded objects. Then you didn't need lasers with bigger 10Watts to Kilowatts, but a Diodelaser with 1 to 5 Watts should be enough. Today you can buy pigtailed diode-lasers with 8Watts laser-power, a fibre with 100 microns core-diameter for 300 Euros and some with lower power for less. I was thinking of the big glass tube. It is of course quite true that solid state lasers have their own problems, and are quite cookable due to operator error. Being able to reprap laser tubes would be improbably cool. Probably a few years off yet though. I wouldn't want to purchase a solid state laser with the intent to zap through big sheets of tough material at speed, true. But spending more time on making a cunning fabrication system would let you get away with weaker lasers... LOM techniques could be use to make larger and tougher objects out of fine layers of wood or plastic rather than paper. I quite like the idea of a wood LOM fabber with a feed tray to one side poking in 1mm thick sheets or whatever, combined with a glue deposition head and a low powered laser head. Or there's the endless talk about laser sintering stuff (could you laser sinter a glass tube to make a laser with?). You might not need the 30+ watt beam'o'death then. This simply isn't true. A laser powerful enough to cut through steel (which is what Nd:YAG and CO2 lasers are commonly used for) when focused will burn things even when unfocused. Slicing up steel seems to be jumping ahead a bit here. But no matter. Yes, a defocussed laser is still a nasty thing, but I was rather assuming that when you make a cutting head you want the focal length to be as short as possible, so past the focal point the beam will diverge rapidly. Making a sacrificial cutting bed out of, say, a steel mesh over a steel sheet is going to prevent the beam going all the way through, unless you set up a toolpath which crashes the head through the mesh, and at that point your endstops should prevent you doing anything really silly. So that just leaves reflected light. I guess that could conceivably toast a corner bracket or something with a few hour's work, but again you'd have to be shooting something that reliably reflects a decent proportion of the beam's energy, and have the toolhead either crossing the right point very often or stationary above it. I'm still not seeing this happen... worst case here is going to be some superficial burning or holes in corner brackets. Severing a bracket is going to be extremely difficult at that point, and cutting part of the metal framework is going to be impossible. Feel free to tell me I'm drastically underestimating laser power here, but from my cursory research into home-made laser cutters it would appear to be very difficult to accomplish anything more than superficial burning even with a well set-up beam. If you're using the aforementioned beam'o'death, sure. But if we're looking at a lower powered device you might make a blob rather than a part, but you're unlikely to slice it into teeny pieces and take the cartesian bot with it. I've just been trying to find the website of a guy who dabbled with making his own laser. There are too many sites out there with similar content though. It looks like the tricky and expensive bits are the lenses and reflectors... the tube doesn't need to be particularly exotic but it probably does have to withstand a fair bit of warmth when the tube is active. I don't think plastic is really going to do the job there, sadly.